The final day of knock-offs is here, and I couldn't be happier than to have Justine from Sew Country Chick close up the series. 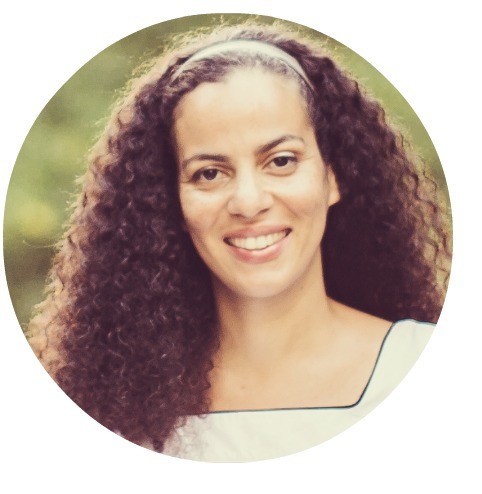 I have been following her blog for about as long as I've been blogging myself, and I have learned a lot from her, as I'm sure you have (or will), too. I have such admiration for her pattern drafting skills and her design aesthetic is so classic and chic. Make sure to head over and check out her new blog design! Thank you so much for being here today, Justine, and sharing yet another beautiful outfit. Hello Elegance & Elephants readers! 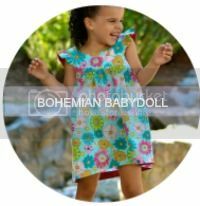 I'm Justine from the blog Sew Country Chick and my today I'm knocking off a dress by Anthem Of The Ants, a brand I recently stumbled across and love. 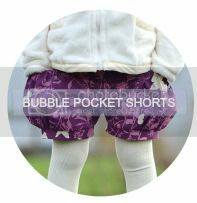 I was having a creative block about what to make for Heidi's series when I found this photo on none other than Celina Bailey's Pinterest board. She has some amazing kids fashion pins.... The outfit was perfect for me to knock off as I had some similar fabric already. My dress fabric is a ponte knit and the original fabric is woven, but I think it's close enough. The most expensive part of the outfit was the purchase of the black fabric buttons, which set me back twelve dollars. The fabric I bought by the pound in downtown LA. Fabric by the pound. $2.50 a pound to be exact. It has a little bit of a sixties vibe which is so fun. How cute are knee highs on little girls? The dress is double breasted with two rows of buttons, patch pockets, and pleats, an element I added. The top has a mock turtleneck and blousy sleeves which have an elastic case. I used the same pattern for all of the pieces. The pleats were necessary because I made the dress too big at first, took it apart and then was too tired after fixing the whole bodice to take off the pockets and make the skirt smaller. Picking seams out of double knit is a thankless task! Read on to see how I manipulated one pattern to create this look. 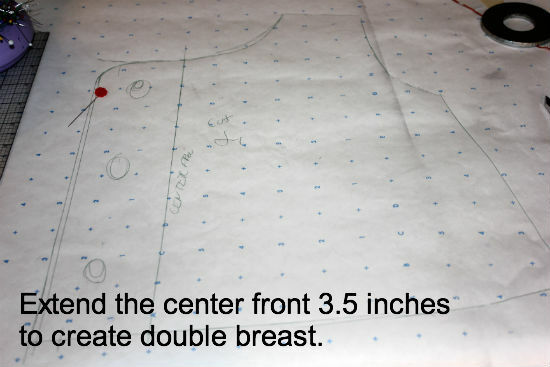 I started with my basic top pattern I drafted. I traced it to create my new dress pattern. I left it as is for the top. 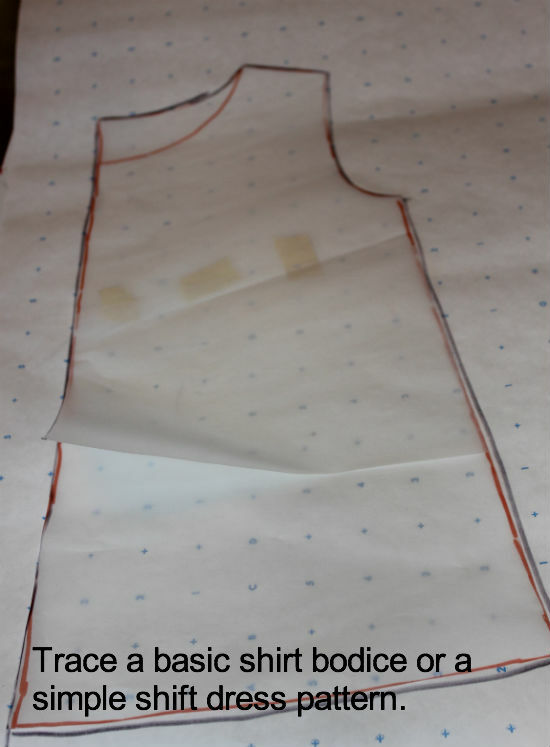 To create an A line shape, cut the pattern up until the shoulder, open it and patch the back with paper scraps. 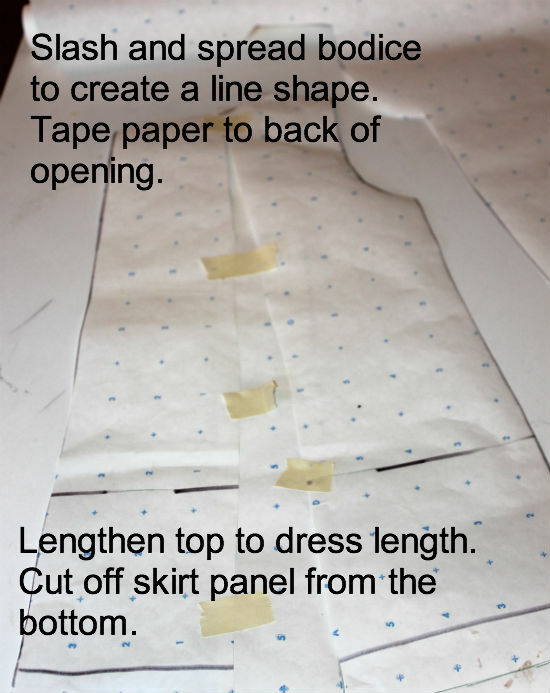 You can do this with skirts, tops, or any pattern you want some flare to. I extended the center front to be wide enough for two rows of large buttons. About 3.5 inches. 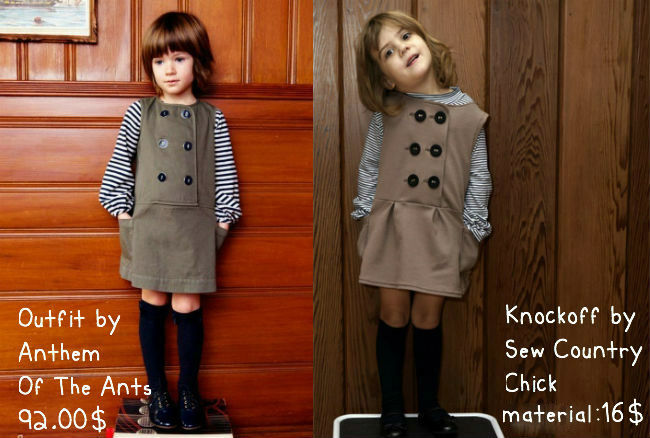 All in one facings look nice on sleeveless dresses and are easy to draft. 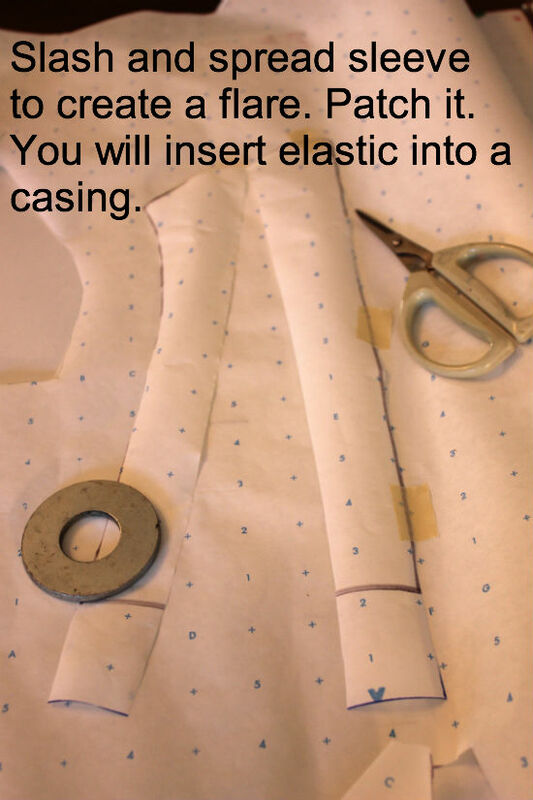 When sewing buttonholes, make sure you have some interfacing either inside the facing or just ironed onto the buttonhole areas when working on knits , so you don't get ugly puckering. 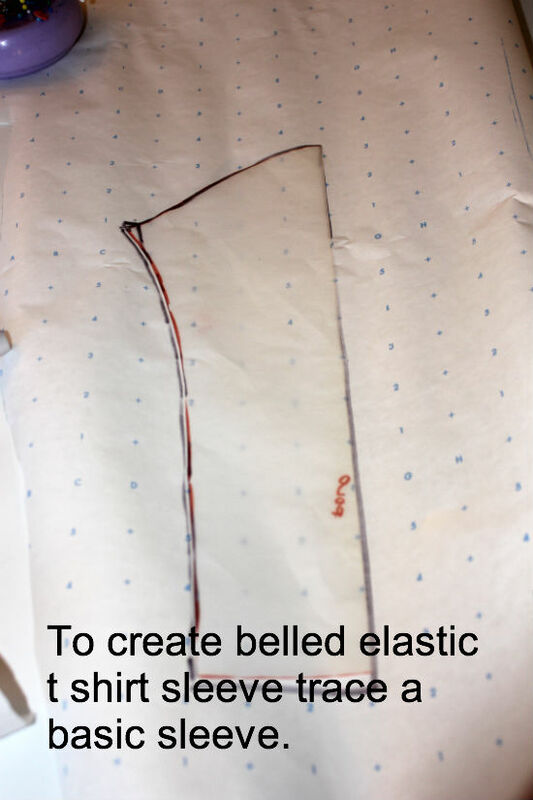 I used the same pattern slashing method to make the bell sleeve pattern. 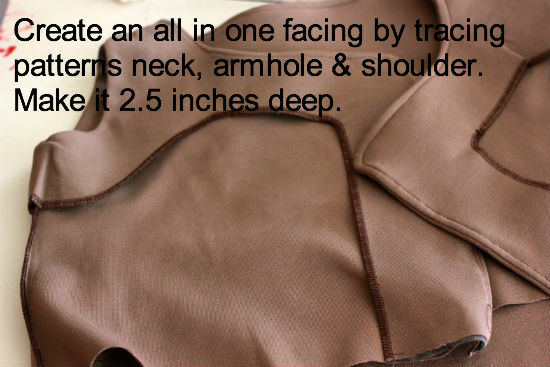 I hope you found my patternmaking tips helpful ! 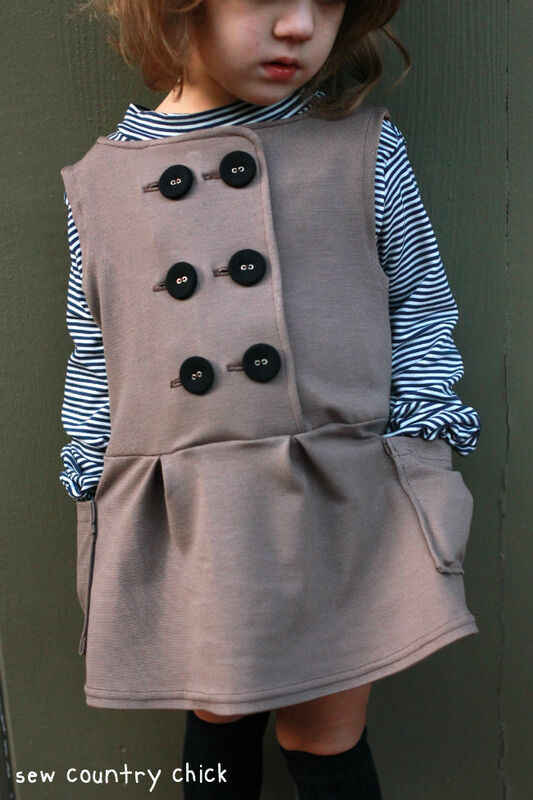 Heidi is such a talented kids clothing maker, don't you think? Stop by the blog to say hi! 7 comments on "Knock it Off - Sew Country Chick"
Awesome job!!! I love yours better than the original!!! The pleats are awesome! What a sweet, sweet style! Another tip for buttonholes (in addition to using interfacing on the back/wrong side where buttonholes will be) use a tear-away stabilizer (on top). You'll be amazed at the results!